Born: 4 August 1837, Saint Maixent, France. Died: 23 April 1919, La Guillotiere, France. Mederic de Vasselot de Regne, French forest officer, was trained at the Ecole Nationale des Eaux et Forets (National Forestry College) at Nancy, France, from 1856. After completing his training he was appointed garde general des forets (forest warden) at Le Mans, in Sarthe (1858), then at Saint Beat in the Pyrenees Mountains (1859), at Arnay-le-Duc, near Dijon (1860), at Marennes, Charente-Maritime (1861), and at nearby Royan (1862), where he was involved in stabilising the sand dunes. In 1868 he was promoted to deputy inspector of forests, and in 1877 as inspector of forests at Poitiers. 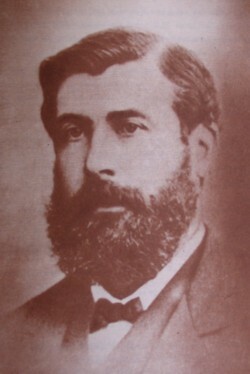 He participated in the extensive afforestation of the Gascony sand plains with cluster-pine (Pinus pinaster), a tree later planted on a large scale in South Africa, and wrote a monograph published by the Forest Administration of the Department of Agriculture, entitled Notice sur les dunes de la Coubre, Charente Interieur (Account of the dunes of Coubre, Charente Interieur; Paris 1878, 78p). De Vasselot was the first to apply a systematic approach to the management of the Cape forests and the principles he laid down have formed the basis on which the forests have since been managed. In 1883 new regulations to protect the forests were issued. The forests were divided into blocks and sections to ensure their systematic exploitation and to match the tempo at which they were harvested to their rate of regeneration. However, the regeneration methods that he prescribed were not as effective as had been expected. In 1888 a new Forest Act was approved by the Cape Parliament to give effect to the demarcation of the forests. Though it served as a model for other colonial forest legislation it was later found to have several shortcomings. Owing to De Vasselot's limited knowledge of English, Arthur W. Heywood* was appointed in January 1884 to translate his reports from the French. De Vasselot wrote three reports: Introduction of systematic treatment to the crown forests of the Cape Colony: Summary of rules and instructions (Cape Town, 1885, 104p), Selection and seasoning of wood (Cape Town, 1885, 73p), and (with Vicomte de Montmort), Hop cultivation (Cape Town, 1888, 41p). He also published three papers on the forests and forest service of the Cape in overseas journals during 1882-1883. One of these, "The Cape forests", published in the Indian Forester (1882) in three parts, dealt with the distribution of the forests and contained a species list and an account of vegetation types. De Vasselot's contract expired in 1891 and his post was then abolished. He visited King William's Town again before returning to France in 1893. Margaret Lister (1957, p. 15), who met him when she was a child, described him as "a short, stocky, swarthy man with hair worn en bosse and ... a vivacious and amusing talker". Cape of Good Hope. Civil service list, 1885, 1888, 1891, 1892. Cape of Good Hope. Report of the Superintendent of Woods and Forests, 1884-1890. Darrow, K.D. Forestry in the Eastern Cape Border Region. Pretoria: Department of Forestry, Bulletin 51, 1975. Hutchins, D.E. Forestry in South Africa. In W. Flint and J.D.F. Gilchrist (eds), Science in South Africa (pp. 391-413). Cape Town: T. Maskew Miller, 1905.